Dave Aubry updated the Club on efforts to wipe out Polio, and he reminded us that November is Foundation Month. Amy Mutal asked us to sign up for the Holiday Party at the Heathman at 6:00 PM on December 3rd. Free Valet parking is available, and wine & beer are included with our dinners. Brandon Honcoop thanked everyone who helped with the Warm Coats project this year; three schools were included and over 100 coats were given to needy children. David Mutal reminded us of the Holiday Gift Party on December 15th: Shopping at Fred Meyer, breakfast, and a visit with Santa while the gifts are wrapped! Let David know where you want to help. John Woodbery announced a work party at First Harvest in Kent this coming week-end, November 10th. Meet at 8:00 AM at the Houghton Park and Ride for carpooling to Kent. Work will be completed by 11:30 and we’ll have lunch! Steve Shinstrom has postponed Bunco until the spring (it was set for December 1st). President Rick called the meeting to order at 6:30 PM. He thanked Tricia and Russ Stromberg for welcoming and Rick Ostrander and John Pruitt for front desk work. Al Hoviland, only 6 weeks after a left total knee replacement led the Pledge of Allegiance. After the Pledge President Rick awarded our Rotarian of the month to Joe Getzendanner. VISITING ROTARIANS AND GUESTS Guests included Jacquie Coyan (member of Rotary Club of Kirkland Downtown) and her husband Rod, friends of our speaker tonight, Chris and Luan Carlisle (Chris is tonight's speaker), Clement Buchanan, Angela Marks and Jim Meniketti. Sorry folks, the picnic on Monday is cancelled due to weather concerns. James Nevers – filling in for the injured Rick Walter opened the meeting and after the pledge of allegiance – thanked Terri for greeting and running the joker pool – thanked John Pruitt for front desk duties – and Rick Walter for scribing. Many guests were introduced – including Michael and Angela in town from Florida to see Tricia and Russ Stromberg – Darcia Tudor visiting us again – Stephanie Walter providing care assistance for Rick. 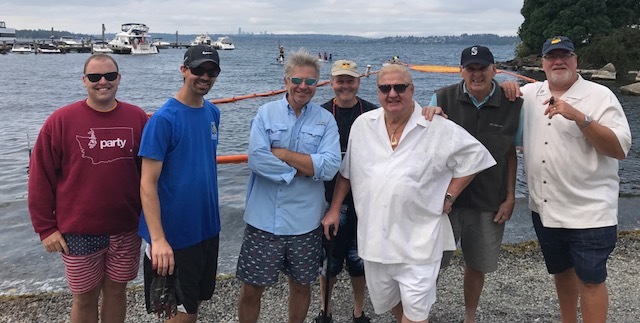 We also had a visiting Rotarian join us – and a current member who has been absent for a while – Gary Brunner – who kept us up to date on his life outside of Kirkland. The Board voted on the very first “Rotarian of the Month” award Joanne Primavera presented it to Ambareen Jaddi for all her excellent work on projects and enthusiasm since joining. James introduced our Speaker – Kevin Mashek – Kevin has been a longtime friend of the current president and has in recent years involved himself and his company with Kirkland. Kevin is the CEO of Dynamic Harvest – one of the largest pot growing operations in WA state. However, for the first 15 minutes, Kevin shared with us his early years as the road manager for the band Styx. That was quite the adventure right out of college. Then he shared his story of marijuana and Washington state and how he became involved – what his business does and does not do. The future of this business and all the peripheral businesses that have grown out of this industry. We had to cut the questions short as everyone wanted to know something – of course, all were disappointed that no samples were brought (against the rules). June 18, 2018 in the Marina Room, Scribes Bob and Gail Auslander. The meeting on the call to order by President Steve Shrinstrom at 6:30 P.M.
James Nevers led the salute to the American Flag. Ernie Norhead gave the inspirational moment about retirement and misbehaving. Announcements: June 25, Transition Dinner in the Tent. Hawaiian/Tropical theme. Come have fun as Steve had the gavel to Rick. Megan will now be finding the scribes for the future meetings. More volunteers are needed for the 4th of July parade. Steve Shrinstom asked for a volunteer to were the duck costume in the 4th of July parade. Sign up will be at future meeting. Happy Dollars: Rick expertly extracted many dollars from happy Rotarians. Speaker: Scott Becker introduced Rich Lerz, CEO of Nytec Co. An innovation center. Developes new tech products. The meeting began on the call to order by President Steve Shinstrom at 6:30 PM. Russ Stromberg led the Club in the Pledge of Allegiance with all Rotarians and guests standing in mutual respect. President Steve gave a charming story as inspiration of a small boy trying to buy a puppy, from a litter listed in a pet shop for $30-$50 per puppy. The owner called out the litter for a demonstration run and one puppy straggled behind and the owner explained he was crippled. The boy offered to buy that one for his $2.37 and to pay $.50 a month until the full price was paid. The owner asked why and the boy lifted his pants revealing his crippled leg with a metal brace and explained he wanted the crippled one because maybe he was the only one who could understand what the puppy was facing. Thanks to Rick Ostrander and John Pruitt for manning the front desk. Guests included Sue Cohn, a former member, Joanne Wright Bill Woods' friend and companion and Patty Shinstrom, spouse of President Steve. Two cards from scholarship awardees were sort of read and a card for Pat Swenson was circulated for signatures in comfort for her accident and surgery for a new shoulder. (1) Next Monday, 6/11 is the Duck Dash Kick Off event at Wilde Rover, 5:30 for drinks and meal thereafter. (8) Special thanks to Rotarian Jason Overleese for his able and creative assistance with the batters, some of them are difficult to communicate with and physically handicapped. Past president’s dinner will be Steve’s house on Wednesday May 9th. The meeting was called to order by Club president, Steve Shinstrom at 6:30 p.m. The flag salute was led by Joanne Primavera. Front desk: Rick Ostrander and John Pruitt. Inspirational Moment: Ernie Norhead shared one of his infamous jokes, and all enjoyed it. Other Visitors: Dillon Mancey (Teresa’s friend), Lacy Clay (Teresa’s mom), Dave Hofferbert (Teresa’s grandfather), Carol Merry (guest of the speaker), Andy Stark (guest of Megan N.), and Eric & Patty Shinstrom. President Steve announced he and Rick Walter attended District Conference this past weekend at the Tulalip Resort in Marysville. It was another successful conference and Rick mentioned that he was inspired by all that Rotary does. Next year’s conference will be held in Spokane. John Woodbery asked for members to consider pledging Duck Dash sponsorship money to keep the Duck Dash going. Donating through the Kirkland Rotary Foundation allows for possible tax deduction. Ambareen Jaddi announced they had a successful day on Saturday painting the crosses for the cemetery (for Memorial Day). They’ll need to do one more work party, so stay tuned for the email. 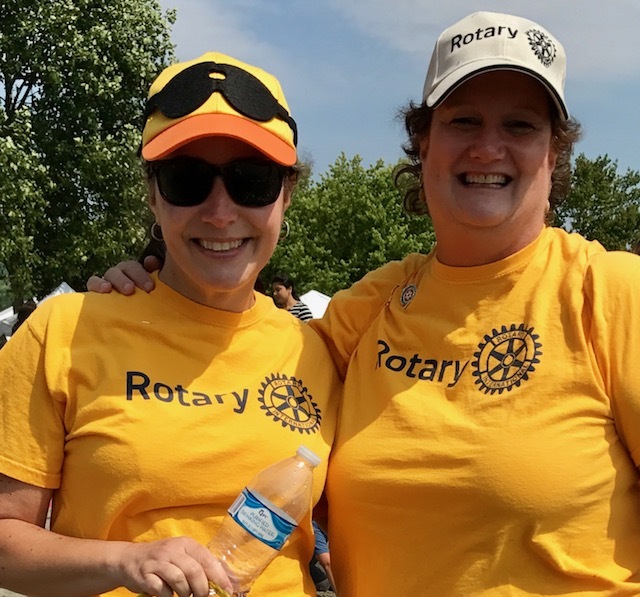 Patti Smith announced another successful day with Miracle League on Saturday, but we REALLY need Rotarians to take time out from their schedule for the next few Saturday’s to be buddies with the kids. President Steve announced the newly designed golf tournament for this year will be held Monday, May 14th at Flatstick Pub in Kirkland from 4pm to 7pm. Sign-up through Steve. Club is covering the cost of pizza and 1st game. Beverages are no-host. Joanne Primavera announced our Club project along the Cross Kirkland Corridor at the South Kirkland Park & Ride: a bench donated by Rotary Club of Kirkland. Dan Bartel announced that Gary and Ingrid Bruner have officially relocated to Houston, TX. We hope to see them when they visit Washington. President Steve Shinstrom called the meeting to order at 6:30 PM. Jason Overleese led us in the Pledge. Kemper and Betty Freeman, Bellevue Club – Kemper has 52 years of perfect attendance! President Steve enlightened us with an inspirational moment around the 86,400 seconds we have every day. Volunteers needed to make crosses for the Kirkland Cemetery. The date is Saturday, April 28 from 9:00 AM to 1:00 PM. The location is 1129 8th Street just north of the Pacific Pride fueling station. Bring work gloves. Miracle League had a wonderful first weekend and volunteers are still needed for this coming Saturday. The picture board that describes our Club is almost ready for District Conference this weekend. A picture after the meeting of all the scholarship winners will be included on the board. The May 14 Golf Tournament may turn into an evening at the Flat Stick Pub, so more details to follow. The Bellevue Breakfast Club desperately needs volunteers for their Saturday Run for Autism fundraiser. If you are interested, check the Bellevue Breakfast Club’s website for more details. Tonight the Club honored the students from our local schools with scholarships. Club members introduced the winners, praising them and their parents for the great achievements in their lives so far. Eight scholarships worth $1,000 each will be given to the student’s school of choice. President Steve adjourned the meeting at 7:25 PM with his usual humorous comment. Rick Walter led us in the Pledge, Rich Bergdahl confirmed he was indeed present, and John Pruitt did the front desk duties. Visitors were Bret O’Rourke, Monica Fratita, Doug Sato of Seattle 4, Areli from Juanita High, Teresa from Lake Wash High, and Nan Bergdahl. Steve’s 3rd to last Board Meeting is this Thursday. He’s not counting though. Next week’s meeting is at Café Veloce in Totem Lake for Tax Relief Day. Check your email for details. District Conference is April 27-29 at Tulalip Resort. Pres Steve and Pres Elect Rick are going. Check the District site for details or with Steve or Rick. Patti Sims announced the first Miracle League Game is April 21. We need you to show and help. Blitz from the Hawks and the Mariner Moose will be there. Dave Aubry thanked Mekonen G, Joe G, John P, Mike and Sharon H and Russ S for helping to clear the site for the Club’s new Legacy Project on the CKC. Pres Steve and Harry W announce the annual Golf Tourney is on May 14 at Willow Run. First flight at 1:00. Check your email for details. 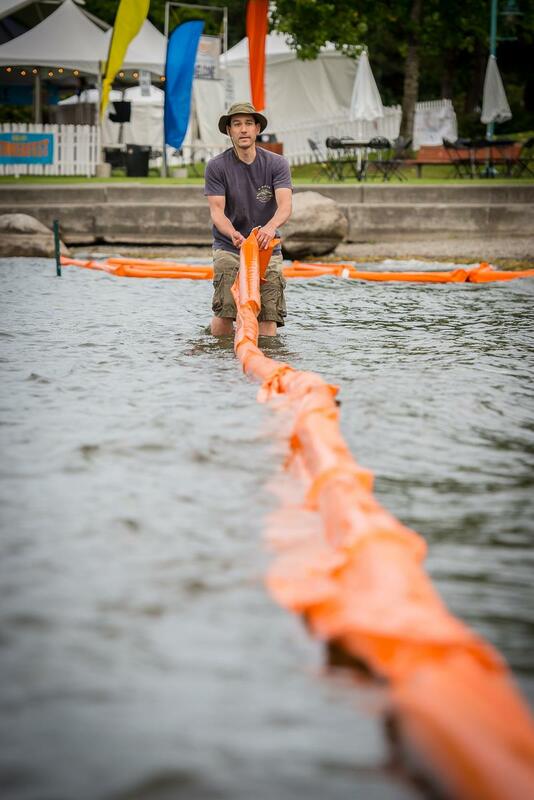 Scott B announced that we’re on track for Duck Dash sponsors, but another $7-8K is needed. Check your email for helping track down past sponsors. The meeting was called to order at 6:32 PM by President Steve Shinstrom. David Mutal led us in the Pledge of Allegiance. The District Conference at Tulalip is April 27-29. A number of ‘Packages’ are available. Do not forget that Miracle League starts April 21, 10AM, at Perigo Park in Redmond. We are actually recruiting more disabled kids to participate. Ambereen reminded us about assisting in cleaning and decorating veterans’ graves at Kirkland Cemetery. Help is needed in placing flags on the Thursday before Memorial Day. Dave Aubry spoke about two upcoming work parties at the site of the Club’s project on the Cross Kirkland Corridor. Volunteers led by CKC Steward Karen Story will be working 9-11AM April 9 and 23rd clearing non-native and invasive species from the area just south of the old station platform, near Kirkland Ave and Railroad Ave. Wear work clothes, gloves and tools are provided. James Nevers reminded us that in three weeks [April 23] we will have our Scholarships Awards Dinner. Rick Walter spent some time extracting Happy Dollars from a number of Happy Rotarians. First off Special thanks to Mike Hunter for stepping in at the last minute to scribe. We really need volunteers to take notes of the weekly meetings. President Steve Shinstrom called the meeting to order at 6:30 PM. Bob Webb led us in the Pledge. President Steve enlightened us with a serious inspirational moment. President Steve Shinstrom called the meeting to order at 6:30 PM. George Anderson led us in the Pledge. Ernie Norehad provided us with a humorous inspirational moment. The meeting was called to order at 6:30 PM by President – Elect Rick Walter, as President Steve Shinstrom would apparently rather be in Hawaii than here leading his faithful flock. Scott Becker led us in the Pledge of Allegiance. Ernie Norehad regaled us with a humorous story, while not strictly an Inspirational Moment, certainly reminds us that humor itself can inspire us to have a better outlook on life. Monica is here for her fifth visit. There were several other guests. However, your faithful scribe failed to get their names, and apologizes for the oversight. The meeting was called to order by President Steve Shinstrom at 6:30 PM and opened with an inspirational moment. Dan Bartel led us in the Pledge of Allegiance. David DeBois introduced Monica, a prospective member who works at Boeing. Rick Walter introduces Sue, a visiting Rotarian from Seattle 4. Bret O’Rourke was also visiting and hopes to become a member soon. Dan Bartel introduced his wife Wilma. Dan also reminded everyone of the upcoming Rotary First Harvest event Saturday, March 10th. The meeting was called to order by President Steve Shinstrom at 6:30PM. Dave Aubry led us in the Pledge of Allegiance. President Steve thanked John Pruitt and Rick Ostrander for manning the front desk and Dave Aubry for Scribing. Monica is here for her third visit. Rob DeCou is here from Los Angeles exploring the area and looking for an area to live in, as well as investigating Rotary. Hans Gunderson, CFO at the Port of Coos Bay, Oregon, is looking to move back to Redmond. Diana Landspa’s daughter, Jennifer, from Mississippi is visiting. And of course, are almost-member, Doug Seta of Seattle 4, is visiting again..
Dave Aubry reported on progress on our Legacy Project on the Cross Kirkland Corridor, and that City Manager Kurt Triplett had specifically requested that the Club be thanked for proposing and contributing this project to the City of Kirkland. Patty Sims announced that Miracle League starts April 21 at Perigo Park in Redmond, 10AM. She reminded us that the program requires volunteers to pair with the kids in order to work. Rick Walter did Happy Dollars, extracting cash from a number of Rotarians. President Steve Shinstrom called the meeting to order. Dave Aubry – Legacy project cleared its first big hurdle by getting the OK from the city council (see prior minutes for details on this project) – Dave also mentioned we have a chance to get free railroad ties if we can get enough members to come help haul them off. Rich Bergdahl discussed the symposium on the 30th at the Performing Arts Center on mental health and encouraged anyone who has an interest to attend. President Steve Shinstrom called the meeting to order at 6:30 PM. Russ Stromberg led us in the Pledge. Kay Griffith – Inducted tonight as our newest member! Rich Bergdahl announced that he and Nan have invited Attain Housing to our Club meeting on Monday, April 9. At the meeting, Rich and Nan, who won some of the prizes from the Duck Dash, will present a check for $2,000 to Attain Housing. The meeting was called to order by Club president, Steve Shinstrom at 6:30 p.m. The flag salute was led by Bill Taylor. Front desk: Rick Ostrander and Rick Walter. Inspirational Moment: Steve Shinstrom presented a Club flag to our guest, Jak Cleveland from the Saginaw, MI Rotary Club. Other Visitors: Camille Cleveland (with Jak Cleveland). Other visitors include Joe Getzendonner, Kay Griffith and Ambareen Jaddi (all three will be inducted as new members on January 22, 2018). The December 18, 2017 Rotary Club of Kirkland meeting was called to order by President Steve Shinstrom at 6:30 PM, John Pruitt led the Pledge of Allegiance to the Flag of the United States. Thank you Dave Aubrey as Greeter and Rich Bergdahl for managing the front desk. Guests tonight were Eric Olsen, former Kirkland Police Chief and club member, Jackie and Raye Phairow, Jackie serving as photographer for the Fred Meyer Rotary gift purchase event Saturday, last; Ambareen Jaddi, prospective member, Claudia Smith visiting Rotarian and Joe Getzendanner, prospective member. The Christmas shopping event was a spectacular success; 44 kids from 22 families joined us to shop for gifts up to $150.00 each. Jackie Phairow was given a racing duck, time measuring machine and 600 lbs. of food donated in her name to Rotary First harvest for recognition as official photographer. Special thanks to Bob and Gail Auslander for their financial contribution for the event and Terry Cole for his masterful arranging with Fred Meyer for a 30% discount to the families and for stepping up and covering the additional amount needed past the Auslander's gracious contribution. Thanks to David Mutal for his organization efforts and Patti Smith made a special mention of the Sandy Taylor cookies donated for breakfast after shopping. Thanks to Alice for her decoration contribution. The volunteer chefs, food and package wrappers were spectacular. 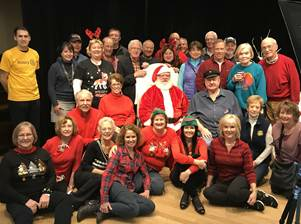 The kids, their families and Rotarians alike had their pictures taken by Jackie Phairow in front of, around or on the knees of Santa Clause, locally known as Rotarian Dan Bartel. President Steve reminded the club that the District Conference next year is April 27-28 at a nearby Casino; and that former President John Pruitt's mane has been ensconced on the Rotary announcement bell. President Steve Shinstrom called the meeting to order at 6:30 p.m. John Pruitt lead us in the flag salute. Steve thanked Dan Bartel for greeting and Scott Becker, Don Dicks for handling the front desk. Guests for the night were introduced: Madie Colanses (Student of the Month), her parents, Pete and Carin, and her brother, Peter. Joe Getz, visiting for the first time. Visiting Rotarian: Doug Seto, from Seattle Four. Madie thanked everyone for selecting her as Student of the Month and told us about herself. This is her last meeting with our group. She focused on the things that are unique about her. She is a 5th year Spanish student, which she loves. She watches several TV shows in Spanish to help improve her local usage of Spanish. Her future plans include studying languages with a hope to become a linguist for the FBI. Madie also enjoys writing and has won several national awards for her short stories. 4. Guests : Mattie Vuortez. She is working on College applications. 5. Joe Gestendanner. Benefits specialist in Redmond & another guest Monica Fratita. Both visiting for the first time. 8. Dec 16th. Rotary Gift wrapping and Christmas shopping at Fred Meyer for the kids. Breakfast, Santa and wrapping. 35 kids. President Steve Shinstrom called the meeting to order at 6:30 PM. Amy Mutal led us in the Pledge. The food drive on October 30 resulted in 1,702 lbs. of food for Hopelink! Meeting at Dub Pub for Seahawks game, Monday evening, November 20th Start time is 5:30. Nice fun social gathering to watch Hawks. President Steve Shinstrom called the meeting to order at 6:30 p.m. The flag salute was lead by Bob Webb and the Inspiration/Rotary Minute was given by Rich Bergdahl. He emphasized Rotary Foundation Month and Polio Plus, quoting from the October Rotarian magazine. October is a matching month for donations from the Gates Foundation for every $1 donated they will match $2 toward Polio Plus. President Steve thanked Bob Webb and Rich Bergdahl for staffing the front desk and Dave Aubry for Greeting. Guests: Sam Douglas and Anna Aubry (wife of David Aubry) and a current Reading Buddies Leader. Brandon Honcoop led us in the Pledge of Allegiance. Ernie Norehad had some words of wisdom for us regarding revenge and the damage it does to the revenge-seeker. He followed this with another patented amusing story. John Woodbery introduced the wife of our speaker Angela McBride and her friend Carin Moore, who also happens to be John’s daughter. Brandon Honcoop introduced Mark Friedrich and Dave Aubry introduced Sam Douglas, back for another visit. Elizabeth Rusnak introduced Ed Fisher, who has been proposed for membership. October 14th Kirkland Rotary Auction: Cancelled. Reschedule in the spring. October 14th will be a work morning at Rotary First Harvest; meet at 7:55 AM at the Houghton Park & Ride to carpool. Lunch follows with your fellow Rotarians! October 30th meeting will be at the Dub Pub in Kirkland with the downtown Rotary Club. Bring food for Hopelink and we will have a vocational, social and community evening. President Steve called the meeting to order at 6:30 and introductions were made all around. Sandra and Ed Fisher were there for their 3rd time, Former Kirkland Rotary President GG Getz is visiting from Atlanta, Don Dicks introduced the love of his life, Merrily, Ed and Lorraine Doyne, Megan Nakanishi introduced her Fiancé, Andy Starks and Mark Friedrich were also guests. As part of Steve’s agenda to keep Rotary fun he’s arranged for us to meet with the Downtown Club, October 30th, at the Dub Pub in Totem Lake. Dub Pub is owned by Athina Mangouras and has games Beer and 72 TV’s so we can eat and watch Monday Night Football. There will also be a can food drive competition between the two clubs so the club that donates the most weight of food, wins! David Aubrey announced the Foundation Auction and dinner will be held October 14th at the Kirkland Women’s Club. Please be thinking of things you may have stopped using and can donate or things you might procure that can be auctioned off to benefit the club’s foundation. And the Bruner’s will be making their Legendary Spaghetti. Brian Tucker announced that the Woodinville club will be holding its annual 0-K in October. Make sure you’re in shape-for drinking beer after jumping over the finish line. Our Club’s annual Christmas Party will be held December 11th at Lilac Café. Pat Swenson announced this year’s Reading Buddies Program for 4th & 5th graders at John Muir Elementary staring in November for 6 weeks. Commitment is 1 hour/week. Rich Bergdahl announced that he needs volunteers for the front desk to help check members in for the meetings. For the newer members this is a great way to get to know your fellow Rotarians! Your Humble Scribe, David Aubry, led us in the Pledge of Allegiance. President Steve thanked Patty Doherty for manning the front desk and Greeting. No introductions were done, as this is the Kirkland City Council’s Candidates’ Forum, co-sponsored with the Greater Kirkland Chamber of Commerce, and we had many outside guests in attendance. President Steve Shinstrom called the September 11, 2017 Kirkland Rotary meeting to order promptly at 6:31p.m. Rick Walter was the greeter, Don Dicks led the Pledge of Allegiance and Rich Bergdahl was at the front desk and provided a fine Inspirational Moment, reminding us about how 9/11 brought him to Rotary and helped unify the country. Guests were: Sandra Sea-Fisher and Richard Kinberg. Rotary Board Meeting is Thursday, September 14th @ 5:30p. Please RSVP with Steve S.
Candidate Forum is September 18th. Please RSVP to Patti Smith. 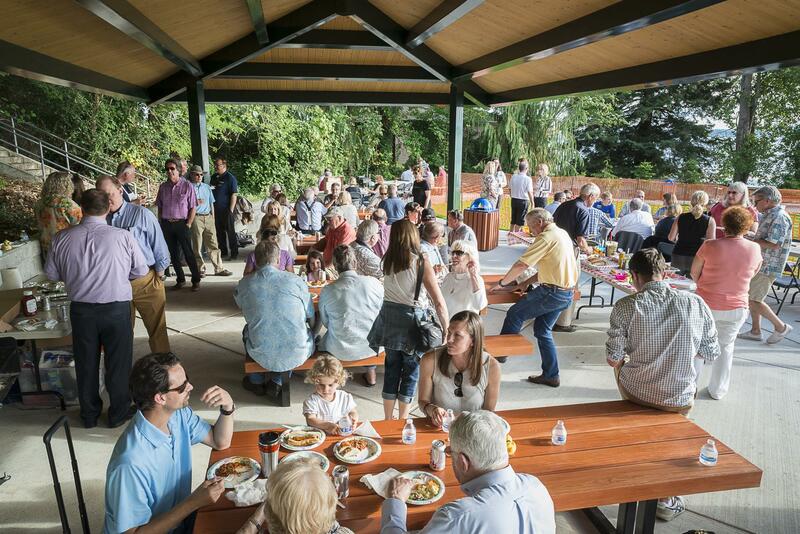 Kirkland Oktoberfest: Rotary volunteers will be pouring beer on September 23rd from 5:00- 8:30p. Contact John Pruitt for more information. Patty Sims announced that the October 2nd Rotary program, “Taking the Risk and Creating Your Own Gaming Company” would be an ideal program to invite the younger generation! Christmas Party for the needy is booked for December 16th. For more information, contact Terry Cole. Happy Dollars: Rick Walter extracted many Happy Dollars that are used to pay for guests and other happy events. Vice President John Woodbery presiding for President Steve Shinstrom, called the meeting to order at 6:30 PM, and also provided the Rotary Minute about Knowledge, Experience, and Wisdom. The Pledge of Allegiance was led by Mekonen Giorgis. VP John Woodbery thanked Scott Becker and Patty Doherty for staffing the front desk, Dan Bartel for scribing, and Terri Ebert for handling the Joker Pool. Visiting Rotarians: Keith Applegate from Springfield Ohio, CPA: Sveehar-Jv, Chamnai Upscale Rotary Club, India, Physician and her husband Umarini Sveedhin who is a Mechanical Engineer. Guests of Elizabeth Rusnak were Sandra Sea Fisher ( Non-Profits) and her husband Ed Fisher (Project Manager-Construction Engineering for Graham Construction); and guest of Jim Feek: Jordan Molla (Advanced Limo USA, Limousine Service). And Megan Nakanishi grand daughter of Bill Woods is now driving him and potentially coming back. 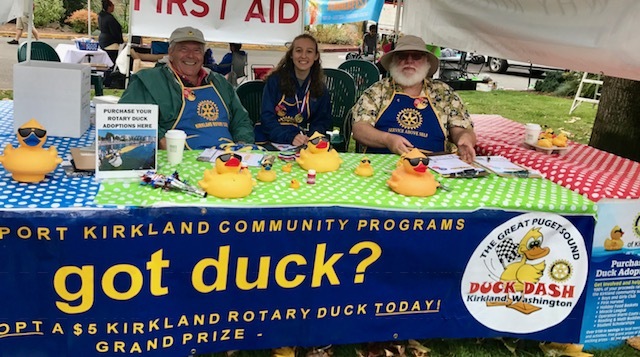 The Rotary Club of Kirkland would like to thank everyone that participated in our 2017 Duck Dash. Below are the results of Saturday's race. Winners will be contacted by the club shortly. Thank you again and special thanks to our sponsors. The meeting was called to order by President Steve Shinstrom at 6:30PM. He had to remind your Scribe that he was supposed to take minutes that night – luckily, pen and paper were quickly found, and we have this record of the meeting. Shoshanna Ryan, the daughter of our speaker Joel Ryan, led us in the Pledge of Allegiance. Mark Shu, who is checking out our club, was introduced as a guest. Visiting Rotarians Arati & Arun Ganacharya of the Shaniwarwada Club of Pune, India, near Mumbai. We were treated to a short talk by Arati detailing information about their club, which celebrated its 50th anniversary last year. The club has 70 members, ALL of whom are Paul Harris Fellows. One of their club projects is sanitation and water conservation in the surrounding villages. President Steve called the meeting to order at 6:30 and Bob Webb led the pledge. Steve thanked Tricia Stromberg and DeeDee Rusnak for manning the front desk and yours truly for greeting and scribing. Russ Stromberg introduced his guest Warren Saul(sp) whom he met while selling Ducks. Warren is a web designer. President Steve introduced FLOKR (First Lady of Kirkland Rotary), Patty. Steve Acknowledged 4th of July Volunteers of note Rick, Patty and Amy for wearing the Mama Duck costume in 80% weather with David making sure Baby Duck’s head kept moving. Brian Tucker saved the day by making sure that Big Duck stayed inflated. The Club Picnic is next Monday at the Waverly Beech Shelter. Please sign up if your coming to enjoy the evening and, or if you can help set up or take down. Duck Dash Sales: Rick was the first to sign up. We are at QFC this Saturday and need sellers from 10-12 & 12-2. Fred Meyer is scheduled for the next weekend. Please put your money in the envelopes when Handing it in. Pat Swenson told us that there are some great tours of Smith Tower, reminiscent of the past glory days of the former tallest building West of the Mississippi. Rick lightened the weight of bills in our pockets by calling for Happy Dollars. The June 23, 2017 Rotary Club of Kirkland meeting was called to order by a healthy Scott Becker at 6:30pm. The pledge of allegiance was led by Gail Auslander, our Greeter tonight was Terri Ebert. and John Pruitt served at the Front Desk. Our Guests tonight were Matt & Terri Clements, Matt an electrical engineer and Terri an in IT Software sales, Scott East from a Bellevue Club was here as well as Doug Seto our Seattle 4 regular guest/assoc. member. Ernie Norehad reminded us what Walter Winchell said that "Peace, a noun meaning a lull between two people cheating and between two countries fighting" or "I try to be nice to people on the way up and see them on the way down" or something like that. President Scott Becker called the June 12, 2017 Rotary Club of Kirkland meeting to order at 6:30. Amy Mutal lead us in the Pledge. John Pruitt and Teri Ekert helped with the front desk. Patty Doherty was the greeter. Guests this evening were Brandon Hencoop’s family, his wife Becca, and two daughters. President –Elect (PE) Steve Shinstrom called the June 5th 2017 Rotary Club of Kirkland meeting to order at 6:30 PM. Rich Bergdahl led us in the Pledge. President Scott Becker called the May 22, 2017 Kirkland Rotary meeting to order promptly at 6:30p.m. Terri Ebert and Ben Premack shared the greeting duties, Anne Hamilton took care of the “front desk,” and Don Dicks led the Pledge. Visitors & Visiting Rotarians: Visitors included John Maini [guest of Harry Wagoner] and Michael and Kathy Oskouian [guests of Scott Becker]. Our own visiting Rotarian, Doug Santo [from Seattle 4 Club] was presented with an honorary Blue Badge. Pat Swenson announced that the Reading Buddies recognition and final meeting for the year is Wednesday, May 23rd @ 12:00 noon. Our Rotary club typically gives $1,000 [sometimes more] to the John Muir Elementary School library for books. Pat has been chairing this worthwhile endeavor for 15 years! Amy Mutal reminded our members of the Chainline Brewing Company Event to be held this Friday, May 26th, starting @ 5:00p.m. There will be a food truck with Brats and other food at the Chainline location [503 6th St. S., Kirkland]. For those who don’t care for beer, there will be wine and soft drinks. The final Miracle League game and party will be June 3, 2017 @ 10:30a.m. The location is at Perrigo Park. All are invited to participate. The Transition Dinner is Monday, June 26th. Save the date: July 4th parade. We want to be well represented and armed with squirt-guns [only if the weather is warm]. Rich Bergdahl is looking for a couple more members to take on the front desk duties. Please contact Rich for the details. And, there will be no Rotary meeting next Monday since it is Memorial Day! Miracle League at 1:30pm this Saturday. Fraternity Volunteers this weekend. 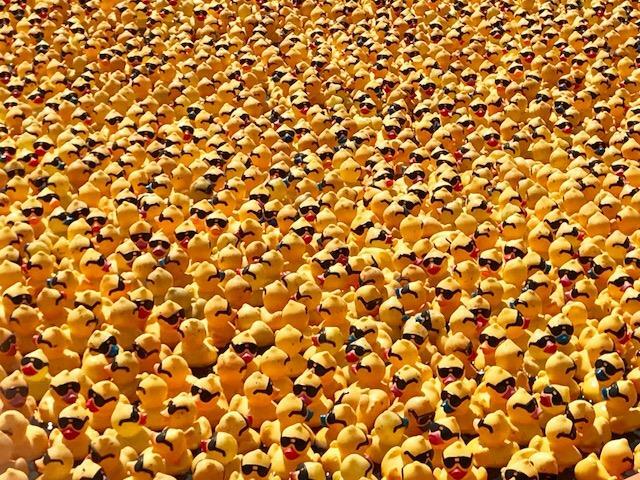 Scott Rethke - Duck Dash tickets Update. Rick will approve anything. Graduate from UW. Loves Bowling, Swimming & Skiing. Lived in Scottsdale for a bit. Approved proposal. Welcome Gail!!!!!!!! Distribution of the Binder and the Red Badge!!! Pictures taken by all!!!! President Scott called the SCHOLARSHIP NIGHT meeting to order at 6:30 PM. Your scribe was allowed to lead us in the Pledge of Allegiance. Ernie Norehad provided an unusually brief but very sophisticated inspirational moment. VISITING ROTARIANS AND GUESTS With this being Scholarship Night we had many guests including the very impressive scholarship recipients, their parents and several friends and even a couple proud teachers. Patty Sims reported Miracle League is going very well and despite next year's board meeting on Saturday we should be OK with Evergreen Hospital helping out. Amy Mutal announced our next social activity will be meeting again at the Chainlink Brewery on Friday, May 26 from 5 till 8 PM. Don't miss it. Reminder - This month's regular Board meeting is this Wednesday 5/10 at 6 PM. Next week the program will be Paul Brown of the Kirkland Reporter. President –Elect (PE) Steve Shinstrom called the meeting to order at 6:30 PM. James Nevers led us in the Pledge. PE Steve explained that he is a late stand in for President Scott Becker. Miracle League was a fun event last Saturday. We need a pitcher for this coming Saturday since Harry cannot attend. The next game will be this Saturday at 10:30 AM at Perrigo Park in Redmond. James Nevers announced Scholarship night next week, May 8. Please attend to support the 10 students and families/friends that will be there. Rick Walter said Duck Dash is coming along with some more sponsors signed up. The July 4th Parade requires lots of volunteers so sign up when the time comes. Todd- Father of Miracle League participant, Jacob. He shared what a positive impactful Miracle League has had on Jacob and all the other participants. He thanked the Rotary Club for all we do to make it possible and encouraged us to continue to volunteer. “It truly is a miracle”. Joanne and Patty Sims - Miracle League starts Saturday the 22nd. Looking for volunteers to participate for two hours on Saturday mornings. Sign up on Facebook or Club Runner. Scott Becker- Thank you for Birthday/Get Well Card. Board meeting reschedule to Wednesday the 19th. Rick Walter: Duck Dash confirmed August 14th. Please register for 4th of July Parade, need volunteers! 1st place winners out of 9 applicants. Awarded $2,000. Used Honorarium on equipment, buying bulk inventory, product line and marketing. Two seventeen-year-old girls from Seattle Washington who love making candles! Their fandom based candles are each carefully matched with the perfect scents for different places and people in books, movies, and the internet. They’re big fans of every product they make, so you can be sure they take special care to make all of our scents perfect! President Scott called the March 20, 2017 Rotary Club of Kirkland meeting to order at 6:30pm. Dave DeBois led us in the Pledge. Gary Bruner did an inspirational moment commemorating the loss of his Mother-in-Law and how we need to help our disabled veterans. Scott East of Bellevue Noon, Russ & Trish Stromberg and our past student of the month Isabella Forcino. Patti Sims mentioned Miracle League is coming but hasn’t had the same support as last year and some of the normal go to folks may have other commitments this year. She is looking for someone to help chair this important set of events with her. Please reach out to Patti if you can offer a hand. The downtown club is having a social and game night at the Brickhouse Pub in Juanita. Starts at 5pm Wednesday the 22nd (TONIGHT) and there is no cost to attend. However food and drinks would be on each individual. Amy said hockey night was a great success. Having attended personally I will agree. Thanks Amy for coordinating. Rich is doing the front desk and still looking for a few good folks to help with the fun and entertaining duty. Tonight was all about prepping for the Duck Dash and getting all member assigned to a committee. We are looking for a volunteer to spearhead coordinating the 4th of July Parade as long time coordinator Steve is going to be busy with Family Commitments. Please let Rick know if you are willing to be coordinator. Steve will help get all supplies and the ducks. Race day committee is on track but still needs many willing to help with final take down at the end. Jason & Steve and others are on task. PR is Ann Hamilton, Bob Webb and Ben Premack to get the good word out on our race. Race day will be either Saturday the 12th or Sunday the 13th depending on final decision made by the Summerfest organizing team and how many days the festival will run. The meeting was called to order by President Scott Becker at 6:30PM. Everyone is glad to see he is on the mend from a recent bout with pneumonia. President Scott recited some words of wisdom asserting that petting a dog will raise your mood in almost any situation. Bob Cohon led us in the Pledge of Allegiance. Matt Scarano with Edward Jones was again with us and was introduced by Pres. Scott Becker. Several people were here with our speaker, from Electronic Rights – Rainier, a group that educates about electronic privacy and security. These included Angie, Tyler Walker who is also a senior at WSU, and Selena, the group’s Director of Communication. Vice President (VP) Rick Walter called the meeting to order at 6:30 PM. Scott Rethke led us in the Pledge. VP Rick inspired us with a story of a returning customer to his business. Patty Sims informed us that Miracle League is almost here! The first game will be April 22 at Perrigo Park in Redmond with a start time of 10:30 AM (Half an hour later than last year). Amy Mutal has arranged a Thunderbirds Hockey Game for us on Saturday, March 18 at the Kent ShoWare Center. The T-Birds will play Portland, a real rivalry! You can also have dinner at the Ram Restaurant at 5:00 PM before the game and then enjoy the game beginning at 7:05 PM. Tickets are $26 apiece and you can pay at the front desk. 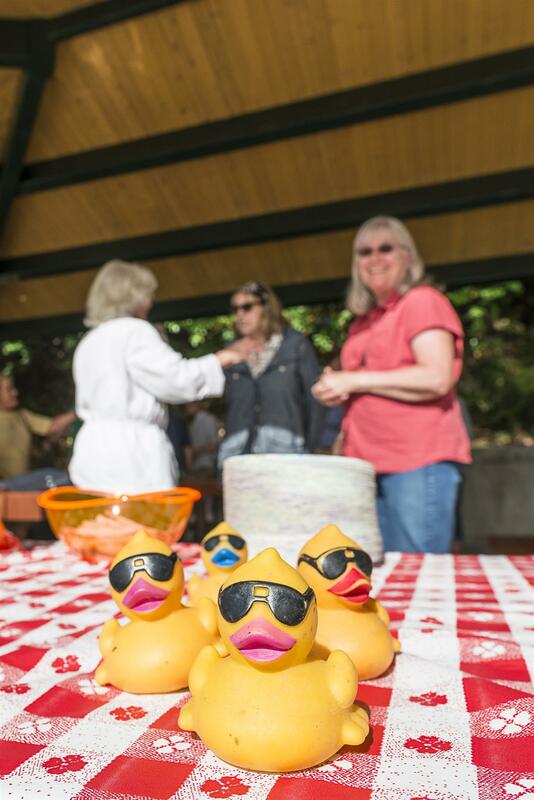 Jason Overleese has set the March 20 meeting for coordinating Duck Dash activities so be sure and attend! President-Elect Steve Shinstrom called the February 27, 2017 Kirkland Rotary meeting to order promptly at 6:30 p.m. Rich Bergdahl was the greeter and also took care of the front desk duties. James Nevers led the Pledge of Allegiance. President-Elect Steve informed the club that President Scott was not feeling well but should be back to the podium in a week or so. Visitors & Visiting Rotarians: Visitors included Russ and Tricia Stromberg, guests of Joanne Primavera, and Isabella Forcino, our student of the month from Juanita High School. Special Guest and Speaker was William [Bill] Kenower. The meeting was called to order by Club president, Scott Becker at 6:28 p.m. The flag salute was led by Dave DeBois. Front desk: Terri Ebert and Isabella Forcino. Inspirational Moment: Ernie Norehad shared his thoughts about nature. Other Visitors: Darren Varnado (guest of our speaker), and Michael Soike (photographer of our speaker). Rotary Meeting Minutes January 30, 2017. The meeting was called to order by President Pro-Tem Steve Shinstrom at 6:30PM. Thanks to Teri Ekert for manning the front desk. Dr. Ernie Norehad regaled us with a humorous minute. The meeting is called to order by President Scott Becker, at 6:28 p.m.
Gail Aulander, wife of Bob Auslander. But, she won’t be only a guest for much longer. The meeting was called to order by President Pro-Tem Rick Walter at 6:30PM. Mike Hunter led us in the Pledge of Allegiance. Thanks to Rich Bergdahl for manning the front desk, with the able assistance Teri Ekert, who also Greeted. Jason Overleese introduced Rick Juma and his son Saleem, who will be our speaker. Dave DeBoies led the club in the Pledge of Allegiance. Our only guests for the meeting were our Student of the Month Varenna Knowles, her parents Phil and Sharon Knowles. Joanne Primavera thanked all who helped with Thanksgiving food donations. Terry Cole reminded the club of the Christmas shopping event for kids on December 17th. The cost is paid for by the Foundation. Amy Mutal announced that the Club Christmas party will be next Monday, December 5th at the DeLille Chateau Winery in Woodinville from 6-9 PM. The meeting was called to order by President Scott Becker at 6:30PM. Eric Olsen led us in the Pledge of Allegiance. Thanks to Terri Ekert for manning the front desk, with the able assistance of Jodi Long, and at times, Amy Mutal, who also was working on the Holiday Gala. We met in the Marina Room of the Woodmark and due to the typical northern latitude early sunset, were not treated to a gorgeous view of the lake and skyline as the evening came on. Rick Ostrander shared a Rotary Moment involving Rotary International and the Rotary Scholars Program [exchange students]. There have been about 42,000 of them since WWII. He recounted two students that his family knew and have stayed in contact with for decades. Doug Seto, our popular refugee from Seattle 4, was once again in attendance. Our Student of the Month, Varenna, was here and will be telling us about herself and her plans next week. Brian Tucker- Asked for Volunteers this Friday for Teen Club. Be there at 5:30 to service pizza. Location is at the Kirkland Teen building near QFC and behind senior center. Terry Cole- Need volunteers for Holiday Party. We need helpers for shopping with the kids, help to take down and set up. See sign up sheet for gift wrapping. Joanne Primavera- Thank David Aubrey and Anna and the crew for coming to the tree house. Thanks to John Pruitt for handling coats for kids while she was gone. Donated over 1,000 coats. Kathy will make sure the coats get worn this winter. Also see sign up sheet for bringing different food items or money for making baskets for Kirkland Nourishing Network. Bring items to next weeks meeting. Please see the calendar for November and December at each table. Let Joanne Primavera know if you are interested in walking at the HopeLink Turkey Trot. See sign up sheet. Rotary will pay for you to be in the turkey trot. The walk is this Sunday November 20th. 3 mile walk from Marina to Carillon Park. The duck should be represented. Meet up where the sailing club meet. Also we can sign up for bell ringing at the QFC. Amy Mutal- Holiday party for the club on December 5th. Copy of the invitation was sent via. email and at your table. We have 30 RSVP's. 15 who have viewed and 15 who haven't opened it. Location is at Delille Chateau and catering by Laura. Steve Shinstrom- sign up for scribe. sign up sheet is on each table. Scott Becker- We have two new students Maya Short and Kala Nazaky both from Juanita Highschool. We will provide funding for their leadership weekend. Don Dicks- Rotary foundation works will e guest speaker next week. Jason Overleese- move the speaker for next week and Jodi Long and Terry Ebert will present next week. Dave Dubious- Thanked Steve Shinstrom for Bunco. Bob Webb- He is putting together PR for what our club does. Please take photos and write articles. Get more things into the site. Rick Walters sent out article for Tree House. Scott Becker brought the meeting to order and Jason Overleese lead the group in the pledge of allegiance. Visitors were recognized – Our student of the month Jorge who will be giving us a small presentation next week in his final meeting with the group. Lynn Petsel will talk later about “NOLS”. Our Speaker “Mickey” Pierce will talk on access to technology. Announcements – Anne Hamilton talked about the Lake Washington Technical College Event; Bright Futures Benefit Breakfast on November 1, 2016. Pat Swenson reminded us about Reading Buddies – the due date to sign on is October 25th and if you need more information, see the accompanying flyer. Dave DeBois let us know that he is in the processing of rounding up children to participate in the Holiday event sponsored by Kirkland Rotary Foundation. More information to come. John Pruitt told us that Operation Warm Coats gets underway this Friday – they have 5 or 6 volunteers but the more the merrier. Brian Tucker, along with Joanne Primavera filled us in on the “K-TUB Teen Feed” event. The goal is to feed homeless kids in Kirkland. The teen feed which is sponsored by the YMCA is held at the Teen Union Building (TUB). The club’s involvement is the 3rd Friday of odd months starting with November so November 18th would be the club’s first feed. Be sure to contact Joanne if you want to be involved. Scott Becker let us know the club is getting involved in the youth movement – We are going to help the Downtown club financially with their efforts with Interact and Rotaract clubs in our area. In addition, the club will be involved with an exchange student next fall. President Scott Becker opened the meeting. Diane Lanspa welcomed members to state the pledge. Scott thanked Rich Bergdahl for manning the front desk and Jodi Long for being our greeter today. Elizabeth welcomed our student of the month Jorge Azpeitia and his family Jorge and Julia Aspeitia Sr. Other guests at her table include Carol Glennon (teacher) and Melanie Artz (year book advisor) both teachers at Juanita High School. Amy Mutal introduced Brenda Kaufman as her guest. Brenda is the manager of Columbia Athletic Club. Jason introduced the CEO and CFO of the NW University. Other guests included Doug Seto visiting us from Seattle 4. Thank you to Rotary. Jorge is 16 years old and was born at Evergreen Hospital. When he was young his family moved back to Mexico where he started school early. When he moved back to Kirkland he was very young and did not know English. He and his brother were enrolled in an English as a Second language class and soon he had caught up with the other kids. He still goes back to Mexico every couple of years to stay in touch with friends and relatives. Jorge attending Robert Frost and Kamiakin. He is a national honor society member and has a passion for photography. He went to Conneticut over the summer to attend photography school and even started a small photography business. He is head of the 2016 yearbook. He attributes his success and positive attitude to his parents and teachers Carol Glennon and Melanie Artz. Scott presented Jorge a duck. Rotary will donate 600 lbs of food to NW Harvest in his name. Scott reminded Rotarians that October 24th is Rotary Polio Day. President Scott called the October 10, 2016 Rotary Club of Kirkland meeting to order at 6:30pm. Patti Sims let us in the Pledge. Scott thanked Rick W & Ben P for manning the front desk. Jason Overleese was greeter and Steve Shinstrom Scribing for the evening. Our guests for the evening included Ryan Addison from Pacific Office Automation and his wife Katherine. They were taking a look to get a feel about Rotary. Dan Bartel did a inspiring moment on the history of the Rotary Youth Exchange program. Started way back in 1927 and today there are between 8 & 9 thousand students participating. each year. Mike Hunter introduced Jorge Azpeitia our Student of the Month from Juanita High School..
Steve Shinstrom reminded everyone about Red, White & Blue Bunco on November 5th. An email sign up will be coming around as he will be out of town for the next two meetings. Patty Smith needs griddles and cooks for the Christmas/Holiday kids shopping extravaganza that is in the works for December 17th. Bob Auslander generously donated $5000 to this event so the kids will be able to shop for presents. Terry Cole and his group need as many Santa helpers as possible for the morning of shopping at Fred Meyer and Dan Bartel is working feverously on growing his beard to be Santa for the event. Ben Premack said we need committed volunteers for the 11/12 Treehouse Work Party n Seattle. Please contact Ben to add your name to the list. Rich Bergdahal is back in the game and has his front desk crew started. He would like more volunteers and has a great start with Himself, Don Dicks, Dave Aubry, Patti Smith and Rick O? (I didn't get all the names.) He would like a committee of 8 or more so that no one person is stuck for long periods of time at the front desk. He will also get the new members their 4 weeks on the front desk as a great way to meet all the members. The meeting was called to order by President Scott Becker at 6:30 PM. The club was led in the pledge by John Woodbery. Bill Woods made a special tribute to the Pledge of Allegiance and against those who refuse to honor the traditions and privileges the flag represents for our country. Ernie Norehad gave the Rotary Minute by reminding the members and guests that we can celebrate World Polio Day upcoming with an event at the Bill and Melinda gates Foundation on October 27th. He also reminded everyone to get their flue shots in October. Although a few intrepid Rotary Club of Kirkland souls ventured out to the Woodmark, there was no official meeting. Instead, the Presidential Debates were turned on in the library at 6:00 p.m. Members dished up their food and they, and a few hotel guests, watched the debates. Mike Hunter and David Aubry manned the front desk. Don’t forget the Kirkland Rotary Foundation Auction this week at the Kirkland Women’s Center, 407 1st St. at 5:30 p.m. on Saturday, October 1. Also, if you wish to join members at the Hopelink Luncheon on Monday, October 24 at 11:30 a.m., please contact Anne Hamilton anneham43@hotmail.com. Mario Batali will be the guest speaker. The luncheon is free, but bring a checkbook for a donation. The meeting is called to order by president, Scott Becker at 6:30 p.m. The flag salute is led by Dan Bartel. Tonight’s Greeter is: Don Dicks. Front desk: Rich Bergdahl. Sondra Pichardo, daughter of Diana Lanspa, was visiting from Atlanta; Terri Ebert, Jodi Long and Steve’s wife, Patty Shinstrom. The board has approved new members Terri Ebert and Jodi Long. They should be inducted within a few weeks. Patti Dougherty’s blue badge arrived. Joanne Primavera reminded everyone the Foundation Auction is Saturday, Oct. 1st at 5:30 pm at the Kirkland Women’s Club. Gary and Ingrid Bruner will be making their famous spaghetti dinner along with another surprise. Sign-ups are needed for appetizers and desserts, as well as help to set-up and take-down. Auction items are also needed. Amy Mutual announced the Nine Club Social that will be held September 29th at Redhook Brewery. Please RSVP directly to Amy. This will be a fellowship night with nine Rotary clubs from the area. David DeBois is coordinating a beer-pour-team for Kirkland’s October Fest for Saturday, September 24 at 8 pm. Steve and Patty Shinstrom are hosting the annual Bunco party at their home on Saturday, November 5th at 6:00 pm. The theme is “Red, White and Blue” (time to get creative). Bring a heavy appetizer to share. Ben Premack will be taking photos of various Rotary events and posting them to our Club’s Facebook page. If you have photos you want posted, email them to Ben and he’ll get them posted. Scott Becker is working with the Rotaract Group of Juanita High School. Program Speaker: Jason Overleese, our Program Chair, introduced Bryan Johnston, Seattle author (of JP Patches) and 11-time Emmy Award winner. Program Topic: Bryan’s topic was about his book, Almost Live, The TV Show That Wouldn’t Die”. Almost Live, the local Seattle television show that started in 1984, was the launching pad for many famous television celebrities. Even though the show officially went off the air in 1999, re-runs can still be seen on King 5 today. Bryan entertained us with the history of the show and the career path of many of the people who were part of making the show a national success. At one point during the life of Almost Live, the ratings of that show were better than the ratings of Saturday Night Live. Almost Live was also on Comedy Central for 2-years. Bryan also entertained us with a few of the clips of a few of the shows, one featuring Pat Cashman (Roscoe’s Carpet Emporium Closing) that was done in one take. Bryan fielded various questions from the audience and all were pleased with the entertaining information about the background of Seattle’s show. The meeting was called to order by President, Scott Becker at 6:33 p.m.
Tonight’s Greeters were everyone in the club. Mike Hunter was at the front desk. Rotary Minute was introduced by James Nevers. James talked about the Rotary Beer Fellowship that has recently been formed. He wishes our club could join the fellowship because young people love beer and partnering with breweries in the area could attract new members. 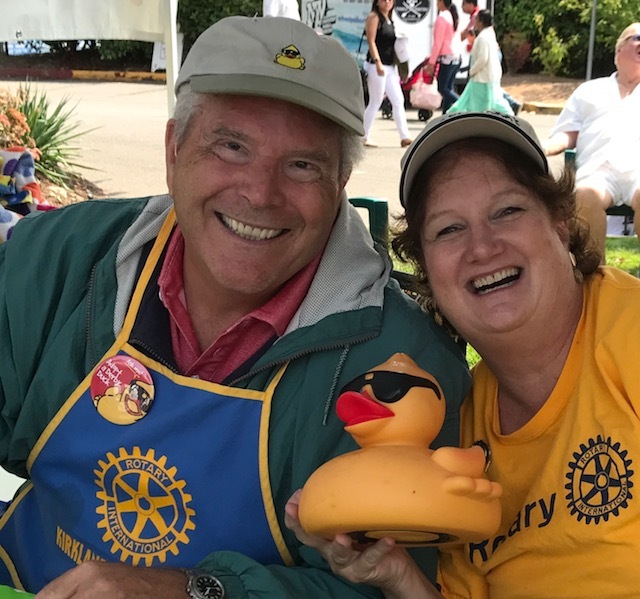 Patricia Darling is the wife of our current District Governor, Bo Darling, and is a member of the Rotary Club of Mercer Island. Joanne Primavera brought Terri Ebert (for the third time). She will submit her application for membership before the Board meeting on Wednesday night. Terri is the human services director at Path. Among other things, Path, a non-profit organization, supplies Polio vaccine to third world countries. Path is also working on a vaccine to end malaria. Maurice (Murry) Kyot joined us from Madison Park. Murry recently relocated to Seattle and is working with Dave DeBois as a banking consultant. Murry has been a member of the Rotary 1 club in Chicago and the Rotary 2 club in San Francisco. President-Elect Steve Shinstrom called the meeting to order at 6:31pm and graciously thanked John Pruitt for scribing, Patty Doherty for greeting, and Rick Walter for handling the front desk. Scribe signup list was distributed. Thank you for signing up for scribe and greeter. Details about the holiday party for needy kids was announced. Dan Bartel and Terry Cole are co-chairs. Date: December 17th [Saturday] from 7:00am until 11:00am. Please mark this event on your calendar! Location: Peter Kirk Community Center, 352 Kirkland Avenue, Kirkland. Also Fred Meyer at Totem Lake. Harry Wagoner and Dave DeBois are in charge of finding families for the event. We will probably host about 40 kids. Patti Smith is in charge of breakfast. Dan Bartel will be Santa Claus. Amy Mutal is in charge of holiday picture. OPEN – Recruiting volunteers for set-up, breakfast servers, gift wrappers, entertainment, etc. OPEN – Recruiting Rotary Buddies for shopping – Note that the budget is $150/a child; Fred Meyer will be giving us a 10%+ discount. Special thanks to Bob Auslander for funding much of the project and Terry Cole for initiating it. The meeting is called to order by President, Scott Becker at 6:30pm. Sunday, August 7th at 3pm is Friends of Youth picnic. See Joanne Primavera for information. Monday, August 8th from 5:30-8:00pm Duck Dash branding party at Lee Johnson Chevrolet. There will be beer, wine and pizza. Monday, August 15th 6:00-8:00pm Annual Salmon Bake. Please register on the Rotary website and let Amy Mutal know what you would like to bring to share. Monday, September 12th is the 22nd Annual Peter Kirk Golf Classic. 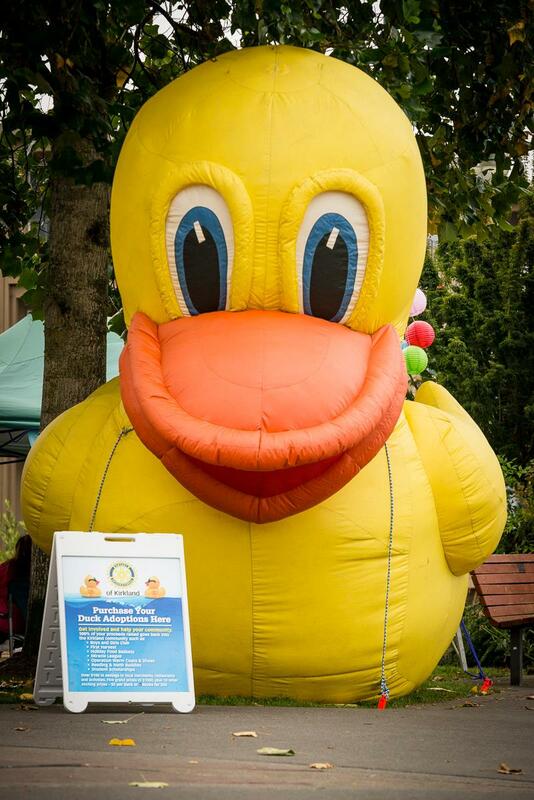 Rotary club of Kirkland is sponsoring a hole and looking for volunteers to work the tent the day of the event. This is a great way to grow membership. Please let Amy Mutal know If you’re interested in volunteering. Saturday, Sept 10th from 8-11am Northwest Harvest Kent Warehouse. 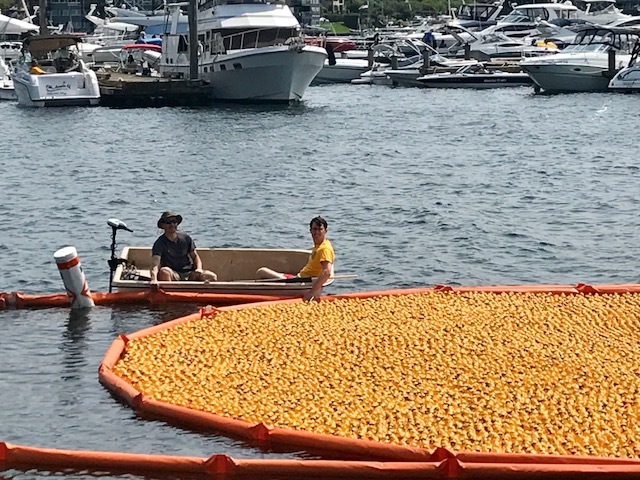 Duck Dash update: Not all Rotarians have reported their sales, so please be sure to get this to Joanne Primavera as soon as possible. Please don’t wait until last minute. There are a lot of open spots for Duck Dash sales. Please be sure to sign up! The fountain near Starbucks is finally landscaped! Thank you Bill Woods for seeing that this gets done. Program was Club Assembly: Scott Becker has asked for all member to get involved! Please let the committee chairs know what committees you are interested in. The meeting is called to order by President, Scott Becker at 6:30pm. The flag salute is led by Joanna Primavera. Tonight’s Greeter is: Patty Doherty. Front desk: Rich Bergdahl Inspirational Words: Scott Becker – Quote by Author of Animal House. Alex spoke about the NEW Rotary Academy that is the inside out of the Rotary Organization. It is online: 8 lessons and emails. For more information or to receive the Rotary Academy Registration Form 2016-2017 - Email Alex @ ach419@mindspring.com. It can also be found on the District Rotary website. 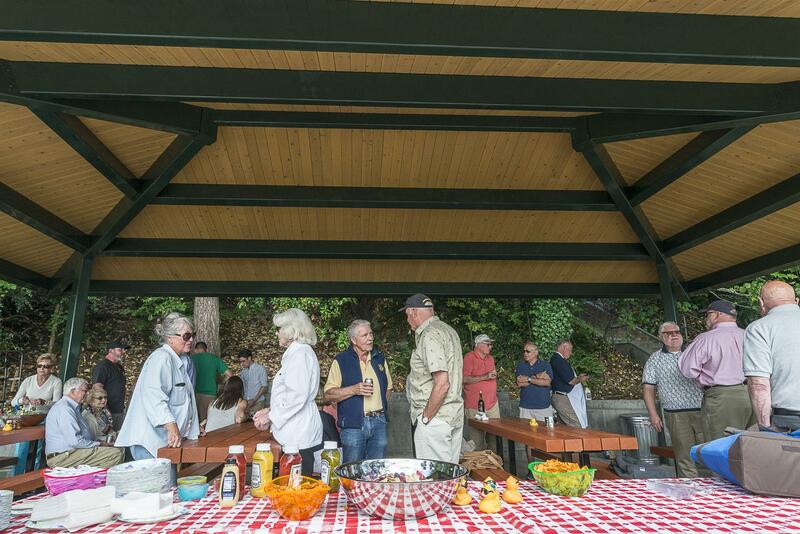 District Rotary Picnic on Mercer Island Sunday, August 28, 10-2:30. We’re having it at Aubry Davis Park. If you have questions, please contact Alex Hopkins, District 5030 DGE, Woodinville Rotary Club (425) 298-0768 or (425) 492-0104 (cell). Joanna Primavera spoke on the “Friends of Youth” and gave out flyers for the New Ground Friends and Family Picnic on Sunday, August 7th at 3:00pm. RSVP to http://evite.me/ezZtTSt9vY. Contact Joanne for more information. 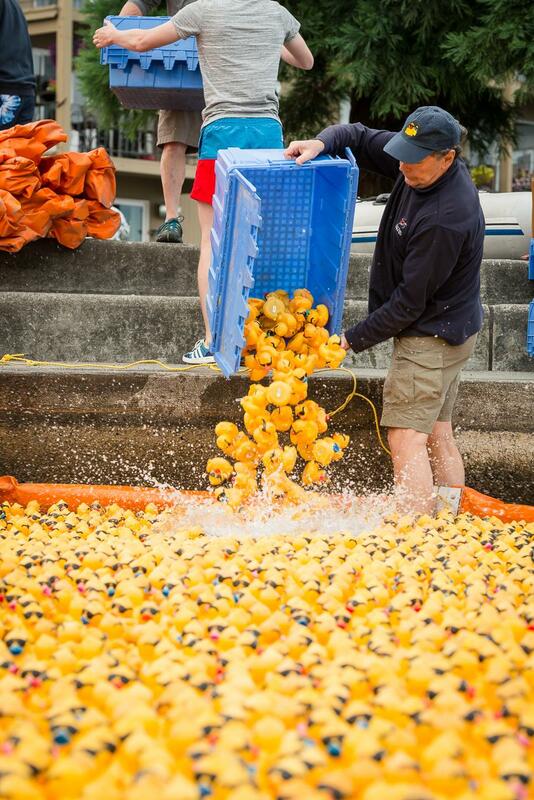 Bob Webb said the Patti Smith had send him an email – ASKING for Duck Dash for QFC this coming up weekend. Bob had additional tickets to sign out if needed. Patti would be sending out the sign-up sheet by email this week. 2016 Duck Dash Teams (Team 2) is ahead with $2,925 in Sales. Next week the new update sheet will be available. Joanne gave out NEW Pre-printed envelops for Duck Dash Money Collection with instructions on how to put money and tickets in numerical order. 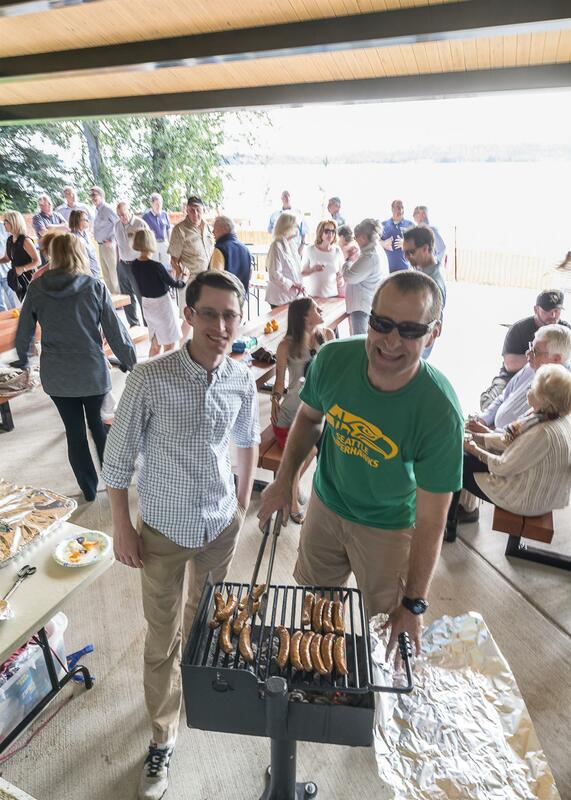 Salmon Bake – Aug 15 (6-8pm) @ Bob & Gail Auslanders. Look for Amy Mutal’s email. 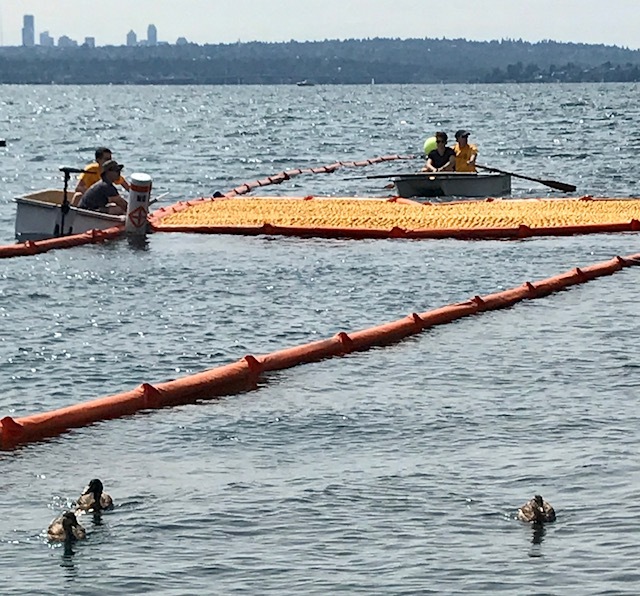 A collaborative effort by Rotary & the City of Kirkland—I’ll have mustard on mine! 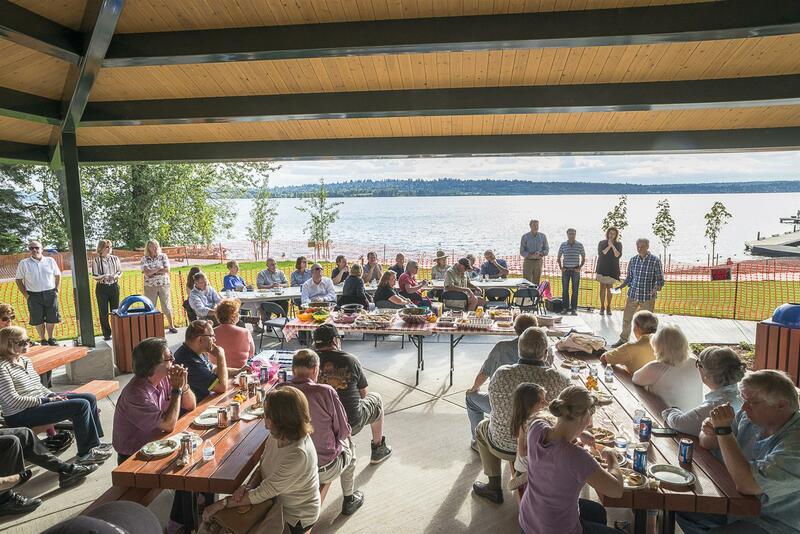 It was a beautiful day at Waverly Beach Park under the new Picnic Shelter. Kirkland Rotary spearheaded and effort to raise money and include this project in the city plans for renovation of the park. Kirkland Rotarian Patti Smith tells us “it was a lot of work by the club, the city and the Kirkland Parks Foundation to get it built”. The design work was donated by Galen Page. Everyone was on hand to enjoy the first BBQ including the Mayor and many city officials who enjoyed a dog from Scott Rethke. Our new President Scott Becker called the July 18, 2016 Kirkland Rotary meeting to order promptly at 6:29 p.m. Dan Bartel was the greeter, George Anderson led the Pledge of Allegiance, and the front desk was manned by Rick Walter [scribe’s note: I thought there was a committee to run the front desk!]. Scott Rethke provided a fine Inspirational Moment, with quotes from Richard Branson. Some of the zingers were: “You don’t learn to walk by following rules. You learn by doing, and by falling over.” Another quote: “A business has to be involving, it has to be fun and it has to exercise your creative instincts.” There were other great quotes; however, the scribe’s typing skills are only so good. Visitors & Visiting Rotarians: We had one guest, Adam Kushabi. 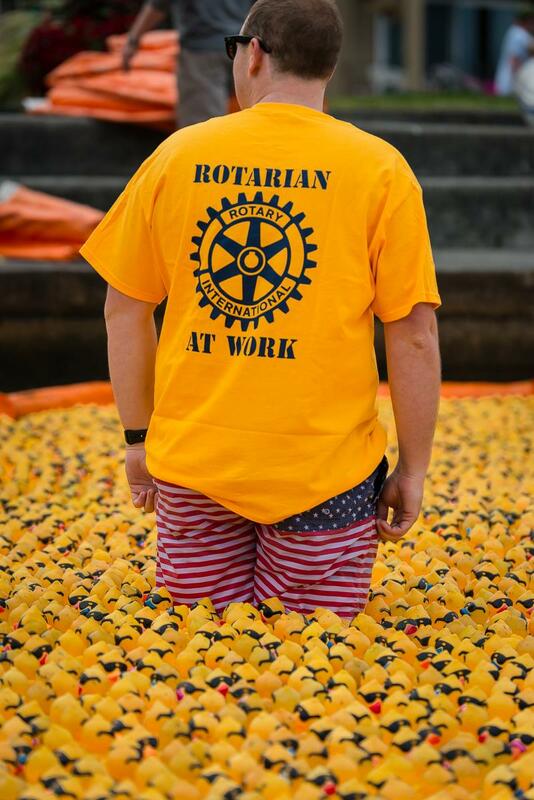 Adam was introduced to Rotary at a Duck Dash sales venue. Adam is an architect with an office located in Bothell. Ran ________ was a visiting Rotarian from one of India’s largest cities. Ran is a Past-President of his Rotary Club. He has a daughter living in the area. Rich Bergdahl apparently doesn’t prepare, he prefers to fly by the seat of his pants and do things off the cuff.